What costs $1,500m, makes no electricity, but “saves money”? South Australia has used federal subsidies to build more wind power than it can use. They’ve spent half a billion already on diesel powered jet engines and a battery that can power the state for “minutes”. For 139 hours last year the state produced so much wind power it supplied 100% of the states electricity needs and then some, and the problem of excess electricity is only getting worse as wind generation keeps increasing and solar PV uptake is rampant. South Australia didn’t even have an interconnector til 1990. Now with decentralized and renewable power they need two? It’s another hidden cost of unreliable power. Put the interconnector on the “Renewables Tab”. It appears to be the direct line from the wind farms that are supposed to change the weather to the proposed Hydro 2.0 scheme we didn’t need. 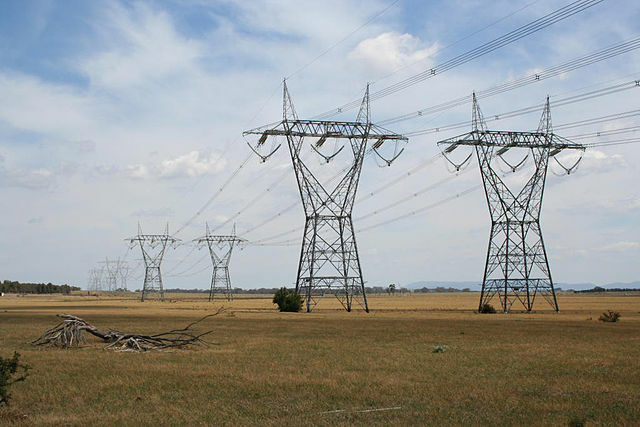 Consumers will save up to $30 on their power bills if a new interconnector between NSW and South Australia is built, electricity transmission company ElectraNet says in a draft report into the Marshall government’s proposal. The report, released by ElectraNet today, finds a new electricity transmission link “would deliver substantial economic benefits”. ElectraNet chief executive Steve Masters said net market benefits were estimated to be around $1 billion over 21 years. But on current estimates, Mr Masters said a new interconnector would cost $1.5bn across both states. The link would be operational between 2022 and 2024. From Anero.id we can see why SA now wants an interconnector that it didn’t need. The total demand in SA is around 2,000MW, so we can appreciate the fun the guys must be having in the control rooms of the SA network as 1,400MW comes and mostly goes. (Graph below). The megawatt mayhem in South Australia was backed up with Victorian brown coal. Now that Hazelwood is shut, they need coal power from Queensland, or if there is any to spare, from NSW. SA has excess renewable power to sell (sometimes) to collect those renewable forced RET payments from too. As TonyfromOz says on THIRTEEN occasions this month (so far), the ENTIRE 1800+ MW wind turbine capacity in SA failed to generate 50 MW of electricity. All up SA has 1,806MW of wind power and then there is 781MW of rooftop solar meaning on a sunny, windy day at midday SA needs to dump some excess on other states. This works like mosquito repellent for any reliable baseload generator, effectively sucking all the fun out of owning a billion dollar resource. Wind penetration was over 100% [in SA] for 139 hours across the 2016–17 year, on 30 separate days across the year. On these occasions, South Australia could have supplied its local demand entirely from wind generation, with surplus wind generation available to export to Victoria. This excess power is spread over 30 separate days, usually isn’t during peak loads (when it might be useful), it creates volatility in the pricing, and helps to drive out the cheapest baseload players. The excess unreliable power is forecast to increase as even more wind and solar projects come into play. “Over the next year, the 220MW Bungala solar project and the 212MW Lincoln Gap wind farm, both near Port Augusta, will also come on line, taking the state up towards 65 per cent renewables, and there are numerous other projects said to be near the point of financial close. At all times the wind and solar power need almost complete back up standing by at the ready. Wind power is constrained if there is not enough back up sitting around waiting to spring into action. The entire point of all this extra infrastructure is to reduce CO2 emissions and change the climate for our grandchildren. The electricity it produces is virtually always surplus to what existing infrastructure could produce. Through some freak of nature, even though South Australia has the *cheapest* electricity generators known to mankind, it also has the most expensive electricity in the world. Not long back, Port Augusta had a thirty-one year old coal plant generating 520MW. The Premier could have spent $30 million to keep it going. h/t to William B in comments on The Australian’s site. 147 comments to Spent $1.5 billion on an interconnector to get a tiny cut in obscenely inflated electricity bills! The concept of “often running in excess” must be somewhat different in Australia. The equivalent of 5.8 days over the course of a year doesn’t seem to quite reach what I’d consider “often”. So what is to be done? Both major political parties have swallowed alarmism and renewables albeit for differing reasons. Turnbull is a dyed in the wool alarmist who BELIEVES in AGW and thinks renewables are the answer. Don’t forget this is the man who gave us $15 lightbulbs and has already spent $6 billion on a pumped hydro scheme which already exists at Tumut and is not used because it costs too much. Shorten doesn’t believe in anything but knows that Industry Super run by his union mates makes a motza from the billions in subsides paid by the taxpayers for renewables so he will keep that ponzi scheme going and ramp it up; and he has an insane left wing part of the ALP who are just as loony as the greens to deal with. Minor parties have some good sceptics but won’t make a difference in the house of reps. That leaves the senate. I think it would make an interesting post to look at the various parties in the senate and rank them in terms of their resistance to alarmism and renewables from a sceptical perspective. Apart from stocking up on candles that’s about all the average punter can do and a post on that issue may provide some guidance. Government costs too much to run. The system, unlike Tumut, has no “off” switch. There is ONLY an accelerator labelled “VOTED BUYING” using free money. If votes could be bought by turning the Tumut water pumping ON, it would be ON. This is how soft, democratic socialism works. No storm troopers or brown shirts required while the low interest rate land price boom continues. When the Federal Reserve increases rates it all goes to hell. The money supply shrinks as land values fall. I doubt 30% of mortgages could withstand a 3% rate rise. 10% will go under with 1%. Australia is on the brink of reality. We have a broken parliament and a crooked government. No hope. Bring on the revolution. Clean out the swamp. And a crooked Opposition, and even worse. reflecting on such brings on a feeling of depression and powerlessness.This nonsense need not be so. We are short of practical thinking politicians. Curse the present lot. I see everybody around the world complaining that their governments are utterly corrupt to the point of uselessness. I fear we are doomed to enter a period where tensions continue to rise until civil riots start breaking out. Interesting times ahead. The Post on the selection and safe use of candles and matches would be both a necessary post for the coming emergencies in power supply and for bringing awareness to our crazy politically run electricity system. A couple of years ago our suburb went without power for 10 days. Unable to recharge our torch batteries we bought new at Bunnings. You don’t get whole days of excess. You get your excess in shining moments and glorious hours (which are only added up to days for the more pedestrian-minded). Finding out the number of those short term instances would also be interesting. On again off again supply. Almost like Alternating Alternating Current. Although with renewables it’s direct current so we get: ADC. Not even 15 minutes of fame. Wrong market, try readers ar Renew. Renewable energy in South Australia is entering a phase of gluts and shortfalls typical of high penetration RE. There will be a push to spend more on storage (or an interconnect to it). Then the push will be on for more RE generating plant because there are times it could store more. This cycle, if left unchecked will continue in the pursuit of 100% RE and increasing reliability; like a crack junky chasing a fix, the cost is immaterial. “Just a bit more storage, a bit more RE plant and we’ll be OK.” You will need in the order of 10 times the RE nameplate power rating compared to conventional baseload in order to get to 100% RE. It will require vast storage and ongoing maintenance on distibuted infrastructure. There will always be gluts that mean decreasing profit; then shortfalls, increasing costs. Its the nature of chaotic weather-based systems. It is a waste and a pipe dream with current technology. RobK, I think you mean ‘increasing unreliability’ at the your above comment. Well, they would be chasing increased reliability with ever increasing expenditure. There seems go be a problem getting to comments via clicking on “comments” on the lead-in article. good their power production REALLY is. In fact, you don’t even have to tear them down. “Remove these locks and tags at your own risk”. a year in electricity charges….NOT just $30. There is no way the politicians of any colour will allow you to reduce the amount they take from the pockets of the public to pass on to their subsidy farming friends and merchant banks. the fruitlessness of the “ruinables”. Pay no attention to the man behind the screen” he says…and then the jig was up…. Yes but at least the Wizard of Oz had a happy ending. In our case it won’t be. Not too many wizards in our Oz at present. I’d say if they get the interconnect make them pay a much higher price for the power they use through it. After all aren’t they now saying coal fired power is more expensive than renewables? Let them eat their own words. I think SA are total hypocrites…they still want the “power” from the polluting black carbon..
Left them stand by their convictions….and face the music ….rolling blackouts ! Hmmm. Achieved the opposite result of what they claimed they were shooting for. Who could have seen that one coming? I recall during summer that SA at best could only produce 2/3 of its power requirements consistently…..thats a bit of a gap…the existing interconnector was kept busy. Tonight around 9pm…S.A. wind production was Nil….and increased Gas ( 1511MW) was the sole supplier in that state…. The demand balance amount, was meet from Vic and Tas 633 MW…….What a joke ! If they think they can get rid of their “excess” unreliable power with an interconnector they are wrong. Even over a continental landmass such as Australia the wind tends to be all blowing or all not blowing at the same time. So unreliable generators everywhere will tend to be all working or all not working. They will all be producing “excess” or nothing at all at the same time. Isn’t that known as synchronising? All fixed now DM, they built a giant Tesla battery and it made the electricity cheap again. Why windmills can never be an economical source of electricity in a 24/7 world. Answer: Because when the wind doesn’t blow, there must be a reliable generator on standby to provide dispatchable power, so effectively you have to invest twice to provide reliable electricity. That is why electricity costs have risen, because there is now more capital invested in generators to deliver the same amount of electricity. Take as an example the Ararat wind farm in Victoria, nameplate capacity 240 MW, completed in April 2017, capital cost $450 million, “feeding enough renewable energy into the grid to power 120,000 homes, 37,000 of them in Canberra”. If we assume a capacity factor of 30%, that’s an average generation of 72 MW so an allowance of 0.6 kW per home, 5,256 kWhr per year. But for Tues-Thurs this past week Ararat produced zero electricity, in fact it consumed about 3 MW to keep those blades turning. Canberra, how did you cope without any electricity? Parliament was sitting, so those pollies must have been even more in the dark than usual. Was that Minister Frydenberg’s contribution to “downward pressure on electricity prices”? The grid must be able to cope with output from Ararat of 0-240 MW, not in response to demand, but at random depending on wind conditions. As it happens, just 110 km away from Ararat there are open cycle gas generators at Mortlake with a capacity of 560 MW. Mortlake represents an investment of $810 million by Origin, including the associated gas pipeline from a gas plant in the Otways. So those generators can also provide backup for Ararat, as well as the 190 MW wind farm at Waubra, 420 MW at Macarthur, and 110 MW at Bald Hills, all in western Victoria. Combined wind capacity 960 MW, average delivery 290 MW. The cost of electricity from Ararat must therefore be calculated factoring in the additional cost of 72 MW of reliable generators, coal, gas, diesel, or hydro available on demand. But it’s worse than that, because in high winds, Ararat delivers over 200 MW spasmodically, so on those occasions it lowers the utilisation of additional generators, reducing their cost effectiveness, and adding to the unit costs of electricity. Wait a minute, what about a big battery like the Musk/Tesla 100 MW battery at Hornsdale wind farm in SA? That big battery cost a reported $50 million (although the SA govt refused to publish the cost) for 129 MWhr. So that would provide 2 hours of backup for Ararat. Therefore, to provide a one week battery backup for Ararat would require 12,000 MWhr or 94 Tesla big batteries at a capital cost of $4.7 billion! Affordable electricity? I think not. Dr Finkel reported the levelised cost of wind generation to be $92/MWhr, but he did not include any backup costs to provide dispatchable, reliable electricity. The AEMO grid has survived to date because there has been backup hydro, gas and coal available when the wind doesn’t blow. But as more wind generators come onstream, utilisation of other generators decreases, putting more pressure on prices and eventual closure of some generators as we have seen in SA and Vic. The government has argued that under the NEG, there will be more supply, putting downward pressure on prices. But if prices drop, plants with low utilisation will close. In SA they now want to spend $1.5 billion on another interconnector, despite having 1,800 MW of wind generators, built at a capital cost of over $3 billion, delivering on average about 540 MW, but sometimes zero. SA has a demand on the grid that varies from 1,000-2,000 MW, and probably even higher in summer. So despite all that wind power, they need to have on standby at least 2,000 MW of reliable power supplies. That’s what drives their costs. Last summer they even added 250 MW of diesel generators to ensure the lights stayed on after they shutdown their last coal-fired power station. Conclusion: Electricity costs must rise with intermittent supplies like wind (and solar) generators because you must also invest in backup generators to supply reliable, dispatchable power to meet demand 24/7. Also if an another interconnector is built between SA and NSW, it will then spread the SA disease to NSW by completely destroying any viability of the NSW baseload coal power stations, as they become forced to shutdown when wind power from SA floods the system. And if anyone was to get a reduction of $30 on their bill (seriously how are these ludicrous numbers calculated? ), it would be in SA whereas in NSW electricity costs would escalate. A recipe for national suicide of the electricity supply. Excellent post. I wonder what people would think of coal fired powered stations if they could only be turned on about the same amount of time each day as wind and solar are available? Of course they would laugh them out of existence. Yet intermittent wind and solar get all the fanfare and coal fired power stations are treated as evil monsters by the major parties and much of the public. I think we need a lesson in common sense taught the hard way – a large does of long blackouts. I believe it’s the only way the message can be made loud and clear to all except the real die hard lefties who want our nation to crash and burn. Just imagine if South Australians lived in a coal generated power paradise like they used to. They would still have cheap power that they could rely on and wouldn’t have to spend lots of taxpayers money ($1.5B), to make it cheaper, but still more expensive than it was before the death of coal. Oh the irony!!!!!!!!!!!! More inter connectors won’t make electricity affordable again. The experiment already failed in the Province of Ontario. A major stakeholder in Electranet is State Grid International Development Asia & Australia Holding Company. The international arm of the State Grid Corporation of China. How could we trust the governments when ministers are prepared to make deceptive comments to hide the facts from us. Example last week in the 2GB Radio Ray Hadley programme when Minister Frydenberg in support of increasing wind and solar based energy claimed that the US has reduced coal fired power stations to about 30 per cent of total electricity generators. He failed to say that the US has many nuclear and hydro power stations and wind and solar are a small segment of the energy source mix. Or that since President Trump overturned the Obama administration coal use penalties new coal fired power stations are now being planned fir the US. Gas powered electrical generators have popped up all over the place with the demise of coal. Fracking kept gas supplies plentiful and prices low. This is why the US has been able to reduce CO2 emissions as gas generation has grown with coal generations’ decline. STEYER: I remember 2006. What happened is that George W. Bush, he put us in two disastrous wars and we were headed toward the biggest financial disaster since the Great Depression. So if the answer is that we need those three things to happen for a course correction, I’d prefer to move a little quicker. How about that? But I take your point. Given the decisions before the government about energy policy, I’ve been talking a lot about the need for reliable, affordable power. The decisions we make now on energy policy will determine the shape of our economy for decades to come. My fear is that we are sleepwalking towards de-industrialising our country and that would be disastrous. We need to ensure that we have affordable, reliable power, and the only way we can do that is if we get more coal-fired power into the system. I talked about this with Alan Jones this morning, which you can listen to here. Oh, Niki Savva is going to get upset now. Tony thr wrecker. the BBC Weather video has a totally sober weather report! huh? BRITAIN will roast in at least another fortnight of blistering sunshine amid predictions for the longest heatwave in more than four decades. Some forecasters are mooting the possibility of freakishly high temperatures holding out through the rest of summer. Weather charts show roasting air smothering the country into the middle of July keeping thermometers persistently locked above 30C (86F). John Hammond, forecaster for Weathertrending, said: “I see no quick end to our parched summer weather. “Computer forecast models are often far too hasty in bringing such spells to an end – and they’re at it again. I suggest we prepare for the long haul. “Water restrictions will increase as fears of drought heighten. Temperatures are expected to push past the 30C (86F) mark again tomorrow making this the most persistent heatwave since the historic scorcher of 1976. Almost two weeks of relentless heat and widespread sunshine is due to an unusual buckling of the jet stream, experts say. Met Office forecaster Simon Partridge said: “The weekend may be a little less hot than the past few days, but there is still a chance we will see another 30C somewhere, most likely in the south. “Apart from this though, next week looks like staying warm and dry with high pressure still in charge into next weekend. The North Atlantic Oscillation is in positive territory, which explains everything. If it was below the line the UK atmosphere would be cool and wet. One other point, this from the Guardian. ‘The heatwave roasting Britain has given Glasgow its hottest day on record at 31.9C – leading to weather conditions known locally as “taps aff”. ‘The Met Office said the temperature on Thursday exceeded a previous peak of 31.1C, recorded in 1950. So what do the dates 1893 and 1950 have in common? The “saving” is purely from a South Australian perspective. NSW will become another effective battery for South Australia with the power rating of the link and infinite capacity. That will threaten the survival of coal generation in the State as the imported volatility will be served by gas generation. The wholesale price in Victoria in Q12017 was $79/MWh. Following the closure of Hazelwood the Q12018 price was $102/MW. Why did Hazelwood close – because it could not operate economically in a market where its demand is up and down like a yoyo due to the variable supply/demand across the link between SA and Victoria. The chart above on the wind generation in SA for June 2018 provides a good example of the issues. With 1810MW of installed wind capacity in the state, the peak generation is being capped at 1300MW, the average output is around 700MW so the moderately constrained Capacity Factor is still an impressive 38%. All good apart from the fact that for 10 days the average was only 150MW. The Victorian monster “battery” was taking up to 600MW when the wind was blowing but supplying up to 600MW when the wind was not blowing. Assuming the wind was supplying an average load of 700MW, there was a 10 day shortfall of 550MW. To put the value of the Victorian link in perspective that is 550MW by 2400hours equals 1,320,000MWh or 11,000 Horsndale Power Reserve. In round figures, the cost of that would be $1,000,000,000,000 (A neat Trillion dollars). At a glance it appears to be the same as the one above but if you look closely you will see the scale is different because this chart has the output from the 5222MW of wind generation across the whole of Australia rather than just the 1810MW in SA. Benefit of geographic diversity is a fairy tale as applied to the geographic expanse of the NEM. There are a couple of small problems with the forecast renewable paradise. Firstly, those new wind farms near Pt. Augusta are connected to? – Adelaide via the existing transmission line put in for the coal fired plants. That means excess electricity has to flow 320-340 kms. and then aother 390km. (approx.) to join up with the interconnecter to SW NSW. I don’t know what the demand is in SW NSW but the exported electricity will need to pause and draw breath if it has to push onto the east coast where the demand is high. A minor quibble is that wind turbines MUST have conection to the grid to align voltage, current and phase angle. No doubt extra money would be spent installing artificial target generators. Secondly: That solar PV generation is from roof top installations. Anything they generate only goes into the local neighbourhood, not into the main grid at large. How it is blocked at the transformer I don’t know but I think it is a safety necessity. SO rooftop PV solar might power the suburbs but won’t power industry or commerce. I think I can safely say that any remaining industry will be forced to use their own diesel generators, but what of shops? How will the Greens prepare the general public for the horrors to come? NO tumeric or soy milk latté coffees! The solar energy generation is not blocked. The transformers work with power flow in either direction. The generators in power stations all operate at lower voltage than the transmission lines they connect to. Each generator has a transformer to increase their output voltage to the transmission voltage. There can certainly be local issues where the distribution network does not have the capacity to handle the high midday output from rooftop solar. In that case the voltage in the area increases to the point that the grid connected inverters either reduce output as the 255V control point is approached or just shutdown at the 258V limit. All grid connected inverters in Australia since 2016 must have over voltage control. Not what I have been told but will have to believe you. So what happens in SA when a cloud obscures the sun? Especially on a hot humid day in summer when the demand is around 2800MW? Do we put in another 3 interconnectors? We won’t have CCGT gas turbines remaining in a dead market, and would OCGTs be suitable (and cheap enough)? My old inverter 2010 installation shut down at 255V. I put this down to being in a local high concentration of solar PV as other residents elsewhere in the township didn’t report loss. I suspect Graeme that on cold winters days the localised system won’t have to cope with too much fluctuation, and of course they will be using the big battery and quick response gas. As you suggest, the big drama will be the intermittent appearance of cloud cover in summer. Interesting. The whole business is stupidity to the Max. Power shortages in NSW already, can’t afford an aluminium smelter. They still have time to build a nuclear power plant and with so much yellow cake underfoot it should be considered an option. This blurb from Westinghouse. I believe we already have a devastating anti-submarine plan. It’s called MDFOSALC (Make Dodgy French Oiler Subs in Adelaide Late in Century). The plan is to proceed, irrespective of cost. A steely-eyed Malcolm has been spotted in Pyne country wearing hard hat and fluoro jacket. When you see that fluoro, he means business. The submarines. They shall not pass. They will not pass. Muster. cli-sce was ne jamais about the science. Miles Kington (RIP) would be proud of you! He wrote about Franglais….the sort of French the average Briton would use while in France! And why does Australia have aluminium smelters, better why did Australia have many aluminium smelters until Labor’s carbon tax, 23 per cent RET and other anti-business government impositions forced closures and others considering closure, loss of jobs, tax revenue, etc? To smooth our the electricity supply from power stations during off peak periods, to add value to the mining of bauxite, to produce aluminium for Australian manufacturers and for export markets. Today’s Paris Agreement blinkered politicians are traitors. It was only a week ago that sinister minister Freudenburgh was quoting the Manager of Tomago Aluminium as saying he was onside with the new NEG and was sure Tomago would “power” on into the future. I didn’t believe him at the time and this has confirmed it. How can the liberal party allow themselves to be led by people like our President and his magnificent Energy Disseminator Freudenburglar. These people have no strength, no pride and no integrity. Over the last forty five years our governments have shown complete disinterest in planning for a transition from largely manual work to the modern world and bought votes with a couple of major schemes designed to give the appearance of them doing something. The dole. ” unemployment benefits” so high that this is seen as an excellent “job” in itself. The main benefit is that it makes people think that the politicians really care for them. This is the biggest and bestest. Governments created more university places and “living”, or was that “playing” allowances to let people know that they were cared for and that their undoubted intelligence was seen and acknowledged. Last great scam is “Saving the Planet” by cutting emissions of CO2. Apart from the Elephant in the room, which is never mentioned in polite society, this scam has everyone under control. The elephant, of course, is that you can’t stop the oceans from “emissioning” the dreaded CO2. Any scientists stupid enough to go against the new orthodoxy are summarily ridded. Our country is not well served by politicians whose sole focus is to get to the end of the qualifying term for their massive Parliamentary Superannuation Package. “We have been experiencing some wild climate variability,” Simson tells Guardian Australia’s politics podcast. “It’s in people’s face”. As the army joined firefighters to tackle the blaze near Manchester and a second fire was reported on nearby upland, scientists said similar events are increasingly likely in future, with potentially devastating consequences for the environment and human health. Guillermo Rein, professor of fire science at Imperial College London, said recent studies showed “climate change is expected to increase the fire frequency and severity of wildfire in Europe”. He said the effect is predicted to be “even more pronounced in northern Europe, including the UK and Ireland”. at the moment people are seeing enormous swings in what would be considered usually normal. Not unlikely at all. This alleged variability can most likely be laid to rest at the feet of the magnetic pole shenanigans. It’s not Anthropogenic Climate Change from CO2 and other emissions. As the ‘pole swap’ comes closer, and the planet’s magnetic field becomes weaker, the weather is going to swing, and probably swing quite wildly, and suddenly. There’s no point trying to fix that. Lightning is not controllable: the charge between earth and the top of the atmosphere will be equalized regardless and anyone in the way vapourized. While our protective magnetic field decays as it prepares for the pole swap, then there is going to be more `equalizing’ (lightning storms)—the sun is not going to stop dumping charge (the Solar Wind) into our atmosphere just because the farmers are becoming disturbed. Nor are more windmills, PV panels, batteries, blame slinging and prayers going to do anything to help cure it. They’re a waste of time and money although the latter may comfort some. To get through it, we need fossil fuels. The #1 Risk to Earth is not a bit of Carbon Dioxide from burning Fossil Fuels. This is not a doom thing, is it? I have no idea. I’ve never lived through a magnetic pole swap before. Neither has anybody else. We’re all on the same roller coaster whether we like it or not so we’ll all find out in due course. back. The Laschamp affair lasted about 440 years with the actual change of polarity lasting around 250 years. Fickle things, those poles. The point to take away is that the planetary magnetic field weakened to about 5% (!) of its normal value. It’s now at about 85% of that value having lost about 15% of its strength over the last couple of decades. That means Cosmic Ray exposure will grow significantly and the Solar Wind will be able to wreak havoc in our atmosphere. Cloud cover caused by the increase in Cosmic Rays will be higher, but who knows by how much? Lots and lots? Just lots? Or just a bit more? More is certain. That means an increase in albedo and less TSI reaching the surface. Will it or won’t it? Colder times is an easy prediction. This is going to add to the reduction in Solar Activity predicted by some in 2030. That renders PV power generation moot. Lots more cloud and colder temps will raise more storms thanks to the SW penetration into the atmosphere. Wind mills might actually be useful but the current attitude of neglect by their owner-operators and lack of control will be exciting. Watch the blackouts. It’s easy to see that continuing using fossil fuels will save lives and maybe save civilisation. Maybe not. It’s uncharted waters but I do think that Global Warming is DED. (Done, Expired and Dead) out to 2100 and maybe well beyond. The IPCC’s claim of “warming out to 2100″ is fraught with insecurity and I would go so far as to say it is 97% unlikely. Perhaps we need to build more coal and nuclear starting right now? I see you’re taking this seriously Soph, fine, and yes one day that may occur, possible, but I have seen too many projections (and other varieties of prophecies) to buy into the ‘great tribulation’ type naratives. They’re all much the same, and I’m comfortable with being mortal-ish, not afraid of the inevitable if it is such. If I awake tomorrow fine, if I don’t, it’s not like I’ll be writing a complaint about it. I expect the polish-flipping will have some rather pretty sun sets amid all the calamity and carnage. As it turns out people who are having a panic attack will calm down amazingly quickly if you look them in the eye and calmly tell them to, “just breathe deeply with me”. And 30 seconds later they’re usually fine. You see people get so afraid that they don’t think or even breathe properly, then their body becomes anxious, but the person does not realise their fear of what they are thinking about is slowly starving their blood of oxygen. Bit of positive feedback later and they are having a full-blown panic attack and have a strong general sense of doom and feel like they are dying. All of it is triggered by their own anxious thoughts spiralling and building, and the their fear responses amplifying while breathing is being neglected, which sums to pure fear and absolute panic … about the imagined and projected. Recognise your thoughts trigger the fear, pay attention to *here-now-real* and keep breathing deeply, which equals no fear or panic, pure relief, good feelings, no worry. Anyway all the best Soph, every breath achieved now is better than everything when you can’t get you’re next one, or some peace of mind. Good sleep, deep-breathing, and a lack of imagination are all very under-rated. CCAH president Kerri-ann Jones said her group considered a silent vigil to be in keeping with the seriousness of the problem as climate change impacts worsen around the world, driven mainly by burning coal. “With coral reefs dying, heat records smashed, the biggest storms and droughts in history, ice caps melting and island communities fighting for survival, we are facing a climate emergency,” Ms Jones said. “Ending coal mining and coal power is a matter of urgency. Fossil fuel companies continue to dig up coal and spew CO2 into the atmosphere, supported by state and federal governments. The fossil fuel industry still has plans to produce far more CO2 than is considered safe,” she said. Attendees are encouraged to wear red or black, bring sun protection and water. ***Our Patron is Rob Oakeshott. Oakeshott of all people, what an ultra-lightweight. This 84% figure maybe a bit dodgy, but taking it on face value the ginger group will need to get cracking. Resurrecting the climate wars would kick start the debate. Friends of the ABC: Mid North Coast Branch….says it all really. With that “traitor” Oakeshott as patron..tells us even more…! People of the Lyon Electorate havent forgotten him…! Trouble with Port Macquarie, they have too many retired City Slickers, trying to tell the locals they “know it all “! Maybe they should talk to the struggling farmers in the area …. Kerri-ann Jones said her group considered a silent vigil to be in keeping with the seriousness of the problem as climate change impacts worsen around the world, driven mainly by burning coal. I do not understand what universe the people writing this report are in. will result in a cost saving to end consumers ???????????????????? how? because magic? how has adding cost and complexity ever reduced the cost of the end product? We here in NSW are to become a milk cow for South Australia. Everyone is a milk cow for SA and Tas. Please send more GST – as instructed. I just wonder if I am missing something. I wonder what mental gymnastics and financial contortions you have to go through to get a saving? Perhaps they mean the Feds pay for the interconnector (another item never to make it to the accounting for renewables) and SA reaps benefits and gives the tortured souls there some relief. The rest of us pay and SA customers get some relief maybe? Something like that, maybe, possibly, I think that’s it….is it? Isn’t it.Eh? (Windlab CEO Roger) Price says the wind and solar at Kennedy are highly complimentary. Last month, existing renewable energy in Australia avoided 2.4 million tons of CO2 emissions, the equivalent of taking 9.2 million cars off the road. These people tell blatant lies, re prediction of sun and wind weather on an “ongoing basis”..
Do these people really listen to what they are saying and selling?? Australia has become increasing FULL of BS artists, and snake-oil salesmen.! Surely Price could not be CEO of a solvent company and believe that such regular climatic conditions exist anywhere in this solar system. Surely he could not be addressing a room full of adults anywhere in this solar system…without being pelted with what objects come to hand. Surely any adults would have clipped his peak. Or have all the adults left since Elon’s Upholstery in Space? Maybe that’s it. Maybe the adult have just given up. No Shannon, this Kennedy windy thing is the real-deal, this one’s gonna work and show the way forward. And even if it turned out to be like, a total freakin crock … hahaha! … yeah, as if … well, it’s sitting right at the northern end of the Galilee Basin’s epic coal measures province. Whoo hoo! More random ignition bonfires! Yingli Green Energy Holding Co., once the world’s biggest solar-panel manufacturer, has been delisted from the New York Stock Exchange as its value has plummeted. Wall Street has held a dim view of solar manufacturers in recent years. Other public companies including Canadian Solar Inc. and JA Solar Holdings Co. have looked to go private as panel prices have fallen and shares have followed suit. Trina Solar Ltd., which replaced Yingli as the largest manufacturer, went private last year. Yingli, which has warned investors that it may not be able to pay debts, will remain subject to U.S. Securities and Exchange Commission reporting requirements for foreign issuers, according to the statement. The company will cease issuing regular quarterly earnings statements. Tasmania’s interconnector was initiated on a promise of ‘net economic benefit’. Instead – over it’s 13 year life – Tassie’s interconnector has delivered an additional cost to the Tasmanian economy of between 50 and 100 million dollars (despite Gillard’s attempt to tax CO2). However and besides the ‘lived experience’ – the Tasmanian Government are now considering a second $1+billion connector in order to drive a net economic benefit that the first interconnector has not delivered. They (the politicians) are all laughing at the stupid arse taxpayers, all the time. garhhahahaha! …. heh, yeah … a lot of people fell for that one. This sort of stuff is hard to read when it exposes, once again, the gigantic misdirection we as taxpayers and consumers are being dealt. 1. Obscenely expensive to build. 2. Only able to function with outrageously expensive storage systems: batteries. 3. Only functional for a fraction of the working life of reliable coal fired generators. 4. Disgustingly dirty in terms of pollution during essential mining operations for the “ingredients” prior to construction. 5. Windturbines and concentrating solar are the cause of outrageous numbers of beautiful birds being killed needlessly. 6. Demolition of defunct generators is frequently “avoided” and becomes a burden on the future. This mess has been created by politicians overriding basic facts in order to accumulate votes and thus guarantee their early retirement pension of approximately $200,000 pa. There is a further, more cynical, aspect to this in that the price transfer lottery that constitutes our electricity system has very specific beneficiaries hidden deep in the woodwork. This mess is NOT the creation of Engineers. A Norwegian plan to force big power consumers and producers to pay for grid upgrades and extensions could disrupt new projects from wind farms and data centers to ventures in the oil industry, companies told Reuters. Beginning in 2019, Norway’s water resources and energy directorate (NVE) wants firms benefiting from grid additions to pay up to half the investment cost, often a major sum in remote regions seeking to attract industry and jobs. NVE, which by Monday will issue an amended draft of its plan, aims to cut overall costs and distribute them fairly by encouraging big consumers and producers to build their facilities in locations that already have strong grids. Norway’s Oil and Gas Association said the rules could raise the cost of supplying electricity to offshore oil platforms, as well as for grid upgrades planned at onshore facilities, such as the Nyhamna gas processing plant. Members of an Oireachtas committee said they were surprised and disappointed that the International Energy Agency (IEA) was still advocating investment in fossil fuels despite global efforts to tackle climate change. Tim Gould, head of the IEA’s world energy outlook team, said there were falling levels of investment in oil and gas exploration globally, which could lead to supply issues in the early 2020s. 25 Jun 2018: Oireachtas: The Committee on Communications, Climate Action and Environment will focus on future exploration, energy supply and energy security on Tuesday,26 June 2018 when it meets with Tim Gould, senior energy analyst at the Paris-based International Energy Agency. The Saskatchewan Government is looking to other provinces in its fight against a federal carbon tax. “It’s certainly nice to have an ally in government across Canada that seems to support the position of the province of Saskatchewan,” Duncan said. He said the Saskatchewan government is willing to share information with Ford, both about the tax-free climate change strategy they’re developing and the legal arguments they’ll be making at the court of appeal. Fedeli dismissed the criticism and warnings from the opposition parties that the new government’s plans would wind up costing the province more money. Analysts at investment bank Jefferies released a note to investors this month saying that ‘rumours of coal’s death are premature’. It has raised its target price of seaborne thermal coal, burned for steam to generate electricity, as opposed to coking coal, which is used to create steel and iron, from £68 to £80 per ton for the remainder of 2018. It also lifted its long-term estimate from £49 to £63 per ton. Though it may have become a dirty word in the UK, with the government putting all its energy into funding renewables, coal is still a vital commodity in developing countries where it fuels the economy. Jason Hollands, managing director at investment manager Tilney, said: ‘In the near-term, the realities of increased demand against the backdrop of the continued global economic expansion are evident, with strong demand from India and South East Asia. Australia was the second-largest exporter of thermal coal last year, sending 206m tons, according to Jefferies. Indonesia was the largest, exporting 387m tons. A TOTAL of 10 anti-coal protesters have gathered outside Member for Dawson George Christensen’s office on Saturday morning, calling for the government and the mining industry not to extract any new coal. Protester Joshua Grant, a born and bred local, said he has been involved in the movement for seven years. Nearly 1 in every 4 people employed in the greater Mackay-Whitsunday-Isaac region works in the mining industry according to Australian Bureau of Statistics data. A report released at the end of 2017 signalled a resurgence in the nation’s resource sector — particularly in the Bowen Basin. Child marriage is increasing in parts of war-torn South Sudan and drought-hit Kenya as parents swap their daughters for cows and goats to survive, campaigners said on Wednesday. Just sighted a letter from Minister Josh Frydenberg to a constituent on electricity prices. Existing government policies support around $280 of savings per year for households in the 2020-30 period. Modelling of the NEG shows it could reduce household bills by around an additional $120 per year over the 2020-2030 period compared to bills in 2017. The Guarantee is predicted to reduce wholesale electricity prices by an average of 23 per cent between 2020 and 2030. So Josh has had some modelling done, but that must be secret work by the ESB. Wait until he releases the savings for 2050 and beyond. Tell him hes dreamin ! Better still ….how about we get “sportsbet” involved…??? Very sorry, but this whole business makes me want to vomit! A glorified extension lead to offload someone else’s intermittent, unreliable and very expensive electricity. Who is running this country anyway? Fools, governed by more fools I say. Or is it simply criminal overcharging. There should be laws in place to protect us from this kind of bullsh*t.
Yours truly and pissed off . . .
Like minded people GeoffW are a growing army of voters. So, build new wind plants, and blow up close old coal fired power plants. It stands to reason that wind power is replacing coal fired power. It (supposedly) has been for the last ten years, so it sort of stands to reason that if there is more wind power in place currently, then there should be less coal fired power, or so we are being told, anyway. Look at this for the power figures from the last two days. I’m seeing something I didn’t think I would, and it’s only come to my notice in the last eight weeks I have been doing the daily power generation figures, with daily comments. I actually thought it was an anomaly, or just something short term, but it seems that wind power has no effect at all on what coal fired power is generating. The only effect is with natural gas fired power and hydro power. if wind power is up, then those other two are down, mainly natural gas fired power, and vice versa, with wind low, then the other two are high. Coal fired power just delivers what it always does deliver. The case in point which confirms it and gives me reason to be brave enough to come out and say it is actually what happened yesterday, as seen in those figures above. For the last 11 days, wind power has been very (very) low, averaging only 850MW per hour, every hour for those eleven days. And for coal fired power, there was only a 100MW fall, less than half of one percent change, and it’s been around that same figure of 18500MW for the last week or more. T the same time, natural gas fired power was down heaps, and so was hydro power. More wind equals less coal fired power????? It’s not isolated either as it has been happening for the last eight weeks. Every time wind is high, the others are low, and vice versa, and coal just hums along without even blinking. It’s something I was not expecting to see, so that’s why it was such a surprise. For the full data and text of comments, here’s the link. I keep an eye on mem-watch and it is obvious that if the wind stirs and SA gets a reasonable return from wind, as they did y’day, they cut back on gas but still import. SA jealously guards any defence contracts, it’s “jobs, jobs, jobs” and all that but deliberately chose to export mining and power station jobs to the eastern states. Only politicians could think that makes sense. Meanwhile Pluckachook in Qld is killing her golden goose by approving a long list of unreliables. We will have closures of thermal power stations soon. On this basis they need to build & provide Gas Fired Power Stations and/or hydro, in parallel with, and to match all future wind turbine output (and at 3x nameplate). How far can they go with such a system of duplication? The Gas plants would have to be on standby for most of the time in order to ‘prop up’ the windmills. Clearly inefficient and costly duplication. And also do we, at this time have the gas in Australia to fire more HRSG’s? Get rid of the windmills. Wind energy makes no sense. It’s not free and is only a costly & intermittent source of supply. Exactly Tony, see my comment at #11 above. To cost wind power you have to pair it with a reliable source so that you have 24/7 dispatchable power. As you have shown, wind is being paired with gas and in some cases hydro. Therefore wind only adds to the investment in electricity generators, it doesn’t displace anything as those reliable backups must continue to be available, and consequently overall costs must increase. And it can only get worse as more intermittent generators come onstream. And the reported restriction of 400 kg CO2 per MWh means that even CCGTs will struggle to meet the target. Any disruption by wind forces them into lower effiiency mode, which means higher emissions, higher costs (and more maintenance because of thermal cycling stress). HELE is right out at 700. OCGTs (the beloved Rapid Response Gas of uninformed Greens) are as bad as HELE for emissions and even more expensive that wind or solar PV. It looks like we will have to use horses going round in circles driving a turnstyle which would avoid emissions (of CO2). There would still be CO2 breathed out one end by the equines and then the unmentionable gas from the opposite end! I mean, really, would we avoid emissions there?! Riding a trotting horse is an amusing pastime. “What is tHe difference between a battle horse and a cart horse? … which is why I turned down an offer to learn how to drive a hitched team way back in my youth. Have you ever heard a horse? When one lets go, the other members of the team have to join in. It’s … ummm … somewhat short of musical. Personally I think the SA Government are flogging a dead horse, or at least one about to expire. How did you get a red thumb and I miss out? Truly the ways of the troll are beyond the understanding of men. Well I hate to say it but it seems to me that governments are right not to be pushing for more base load power generation be it coal, gas or nuclear. The state of the power grid at the moment makes it pointless to put more generation into the system. All across Australia grid managers are fighting a daily battle to stabilise the system due to the now you see it now you don’t nature of renewable energy. Why have governments over the years allowed the unregulated expansion of unstable power generation? Global warming? Stupidity? Again I hate to say it but it is way past time for serious regulation of all electricity generation in this nation. Start by forcing the 20% of homes with pv on their rooftops to install batteries to store their excess generation and then cut them completely off the grid. No more feedback tariffs etc. Is that the sound of solar panels being sledgehammered off roofs that I hear? Like wise all these wind farms and large scale solar thermal generators need to be forced to store the power they produce before it can be allowed onto the grid in a controlled way. The days of dumping electricity onto the grid whenever you feel like it have to end. Once the system is stabilised we can then do a proper assessment of energy requirements and build the most cost effective power stations (coal?) as needed. No political party will go near this of cause so power prices will have to continue to skyrocket as regulators will be in an never ending race to keep upgrading grid infrastructure to stop the whole joke blowing up in our collective faces. There are currently 22 large commercial scale solar plants in Australia with a total Nameplate of 966MW. On a daily basis over the last eight weeks, they reach a peak between 300 and 400MW. (on a good day) That peak can be as long as for two hours or so around Midday. The insolation rate determines the total power generation, and it is (basically) half a sine wave for the shape of the Load Curve for power generation, and the average of a (half) sine wave is peak X 0.637. So, the average power for an average day is around 200MW. That is for the 10 hours of operation, from Sunup to Sundown, currently from around 7.30AM til 5.30PM. So, for the full 24 hours, that average then becomes 200 X 10 and divided by 24, so around 80MW average per hour. That comes in at 1.92GWH. So, over the last eight weeks, all those 22 commercial solar plants have delivered ….. 0.4% of the actual power that Australia has consumed. Makes you wish there were so many more of them, eh! Absolutely pitiful is the best way you can describe it. There is NO such thing as large scale solar thermal generators. The “huge” one planned hyped for Pt. Augusta is nominally 130MW capacity, but as Tony has pointed out gets most of its energy during the 5 hours of sunshine when the sun is high in the sky. Running it 24 hours a day would only give about 42MW output (provided the sun shines brightly). Most solar thermal units either shut down in the 3 winter months or burn large amounts of gas. The Aurora project won’t have a gas connection! Put that in context, you could run 5 large dual fuel diesel units (in a bank of 8 for reliability) and get as much power more certainly for one sixth the cost. A Closed Cycle Gas Turbine unit would cost about the same** and output over 12 times as much electricity. ** the claimed cost for the Aurora type is less than half the last one built 2-3 years ago by the same company. The way the RET works, the problem is not having enough certificates for wind or solar, LGCs and STCs. What it means though is that these must be purchased, regardless of price. That is not a market but extortion. So it raises a question about all the windmills. Take Hepburn wind. We have paid for the windmill with our cash and they own it. We have given roughly as much again as they earned from selling the actual power at record high prices. Now the owners have paid off the windmill ten years early and still receive our cash. For what, no one knows? Anyway, officially they still make a loss, despite selling the free, renewable wind electricity for $700K every year. You have to wonder what the costs are which total $700,000 for ‘operating’ a windmill? Does anyone know why it should take $12,000 a week to watch a free windmill spin? Is there a manager on $350,000 a year? Is there maintenance on another $350,000 a year? Plus another $12,000 a week in free cash for simply creating those wind based electrons. Besides, why are they receiving any cash above and beyond what they are paid for electricity at the world’s highest prices? Don’t these Greenies feel a little guilty at accepting the river of money for doing nothing at all? Or is it symptomatic of the entire Green wind industry, no actual limit on what they can charge for what people are force to buy and then again for the mere fact of generating it. No guilt. They are saving the planet. Allegedly. How that actually works is unknowable, but it sure beats any other business. A money pump, renewable. None of this would be happening without the huge distortion of the energy market by government. Then even more complex and deceitful legislation to pretend to fix it. Batteries, diesels, pumping water uphill, more wind, more solar, more laws. $100million fines for big users. All wrapped up in complex and even sinister legislation. Just read the RET act. Deceit wrapped up in convoluted language like the new NEG. Written by anarchists in the deep state in Canberra. The only Energy Guarantee is that things will get much worse. All for what, the huge disruption and expense only for democratic governments and their people? France, Britain, Australia, New Zealand, Italy. Here banning even the sale of coal (Victoria), banning even exploration for gas, banning coal mines, banning new dams, banning even picking up forest litter for a fire, taxing even the air we breathe? Gender, class and race in every law. Self hate. This week an orchestrated attack even on democratic cows producing methane from digestion? This is madness, this long march to undermine democratic countries from within. So how effective has all this been over 30 years in achieving any aims? Measured as ‘emissions’ and enforced by laws and voluntary obligations, what is the effect on world CO2, world methane, world temperature? Nothing. Nothing at all. All for nothing. Never has such rampant nonsense been forced on a democratic population by politicians with no actual measure or concern of the effect on the alleged problem. Say $30Trillion in 30 years to achieve what exactly? Record cold temperatures in NSW (Last week), snow in Cairo (last year), freezing conditions in Bangladesh (six months ago) and no real warming anywhere? The government funded media are an integral part of this world deception. Even if the CO2 warming argument was true, the seas were rising, nothing has affected the growth of world CO2 even slightly. It’s as if it was all a bad joke. On us. Cui Bono? It’s all about money and power. Using the weather. Only Donald Trump gives us hope and so he is hated by the media. The rest of the world seems to have descended into a form of herd madness and irrational fear and in the grip of media fake news, fake facts and fake science. Warming? What warming? Where? Where are these people drowning, polar bears vanishing, seas rising? Meanwhile our prestige universities decry our British origins, our governments, our right to exist. We need to be punished, made to apologise for everything and Turnbull’s only argument is that Shorten would be even worse and punish us more? Could we please have Abbott back? He made sense. There is no man made Global Warming. Climate Change does not exist. Even the CSIRO could not detect it in 3,000 man years of research at our expense. Personally I like the idea of the inter-connecters to SA. UHVDC (Ultra High Voltage Direct Current) would be very good, perhaps one to Melbourne and one to Sydney Direct.They can transfer electrical power up to 3000 km quite efficiently. Basslink is a HVDC version of this. You just need to start it at Roxy Downs hooked up to a Nuclear Reactor. Process the uranium on site and keep it in one place. Right Idea wrong power source! I don’t get it. SA wants to get as close to 100% renewables as possible yet they want more coal power imported? Hypocrisy is just too mild a word to describe it. People go to prison for playing tricks like that in the real business world. These true believers are playing a very bad joke on the majority of uninformed power consumers and it will backfire on every one of us as this State sponsored form of dumping drives thermal generators out of the market. I guess when they reach crisis point it will be time to conjure up expensive diesel generators like we’ve seen in SA and with the Tasmania Basslink/hydro problems. Just add a unicorn big battery or two to divert attention from the obvious I suppose. Seems to have worked so far although the natives are getting restless with the highest power prices in the world as a result. And the arrogance of the words in the same short segment, “…because I’m capping greenhouse gases…” So he’s going to cap greenhouse gases, he’s going to make electricity prices skyrocket, he’s going to make the citizens of his country work longer and harder for their energy needs. His arrogance, his pomposity and smugness is vomit inducing. South Australia could be a good case study to expose the truth of renewables. A study could easily show the true operating cost of each power source, the subsidies that are applied, the hidden capital investments required to keep the “fantasy grid” going, and the resultant costs to consumers. All nicely contained within SA, so close to being a failed state. The Victorian Andrews government should be using their limited state powers to shut down the interconnects to SA. That way, the available supply to Vic consumers increases, and the price for Vic consumers will fall. For SA it would be a disaster with regular blackouts across all supply sectors, but so what? For generators, it would lead to lower profits, as they are restricted from selling into the higher priced SA market. But so what as well? By the way, I am a Victorian. That’s all right, DaveR, some of us won’t hold it against you. Yes Graeme No3, it would hurt SA badly, but isnt that what SA deserves after allowing the Weatherall soviet regime to damage your generation capacity the way it did? But I shouldnt shout too loudly, because I also hear that Vic is now reliant on the NSW interconnect and Basslink! If Victoria has a generation shortfall, the impedance of the interconnections will naturally cut the supply to SA since the transmission path from Latrobe Valley necessarily passes across Victoria’s major load points before reaching Heywood and Red Cliffs. Some flow from the Snowy’s may get through to Red Cliff but the MurrayLink interconnector only has a capacity of 220 MW so I doubt SA can drag down Victoria. Dan Andrews and Lily D’Ambrosio are doing their best to bring Victoria down to the same level of vulnerability, though. Hopefully they won’t be able to raise the funding to get their snouts in the trough. The whole things reeks of subsidy slurping. $100 million from the State government (and obviously looking for more), $110 million from the Federal government, pretty soon you are talking about serious taxpayers money down the drain. If they can’t make money when a third of the cost is free, and they can charge almost double (before subsidy) the going wholesale rate, then the project is swill. Did Tony also point this out? Did he also correct it, on closer examination, to less than 30MW ? Thank you for your email to the Hon Steven Marshall MP, Premier of South Australia regarding the Government of South Australia’s commitment to an interconnector to New South Wales. As the matter relates to my portfolio responsibilities as Minister for Energy and Mining, your email has been forwarded to me for a direct response. I note your concerns that South Australia will not be in a position to export to New South Wales. The Australian Energy Market Operator’s 2017 Electricity Statement of Opportunities provides a projected 10-year outlook to 2026-27 of supply adequacy under several scenarios in the absence of future development. Their analysis shows that an additional 850 megawatts (MW) is required to minimise the risk of load shedding in New South Wales, if the Liddell Power Station closes. This takes into account that electricity consumption in the National Electricity Market (NEM) is forecast to remain relatively flat over the next 10 years. •	Dalrymple battery storage project (30 MW). Recognising that South Australia has and will continue to have an abundance of renewable energy, we plan to support and use it to its greatest potential. This will be done through better interconnection between South Australia’s renewable energy and other states in the NEM. This will also allow improved access to their baseload generation when needed. The interconnector and our other energy initiatives will provide a more reliable energy supply for our state. It will also put downward pressure on wholesale electricity prices by reducing the market power of gas fired generators and improve the ability of new retailers to gain access to hedging arrangements, increasing competition in the retail sector. Thank you again for your email and I trust that the above information is of assistance. Hi and sorry for the dump.